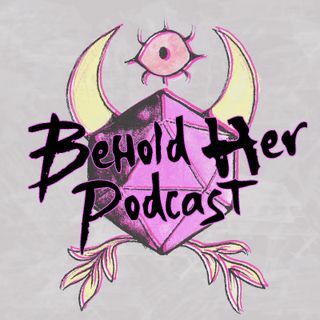 In Episode 3 of Behold Her, host and producer Lysa Chen talks to women who produce, star in, illustrate, and research live tabletop actual plays. Guests include Hadeel Al-Massari, the wizard Nejma in D&D's Trapped in the Birdcage, Kayla Cline, illustrator and SP0-R3 in Encounter Roleplay's Rise of the Dark Side, Elyssa Grant, producer of Acquisitions Incorporated's The C Team, and Hettie Rowan, the Critter Thesis Critter researching the fandom of Critical Role. The episode ... See More ends with an audio story, written and read by Shauna Nakasone, co-host of Waffle Talk, about how D&D helped her embrace her identity as a transgender woman.